Destination Ladakh but we were in no hurry to reach. 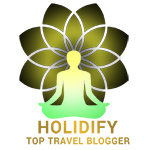 We wanted to explore places on the way, savor the slow travel experience and planned our road trip via Punjab, Jammu, Kashmir Valley and then head to Ladakh. 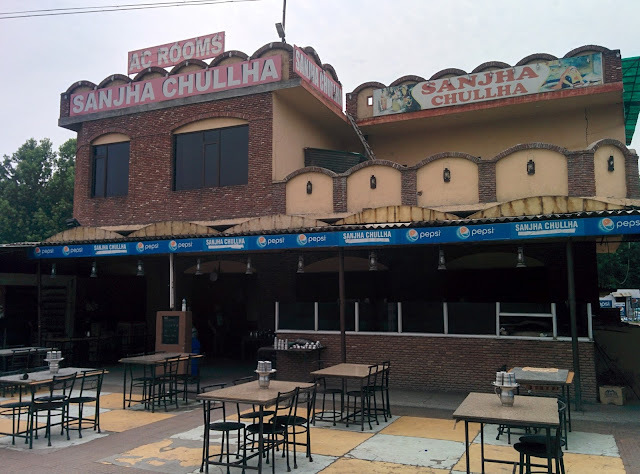 Our tryst with Punjab made our love for road trips even stronger. 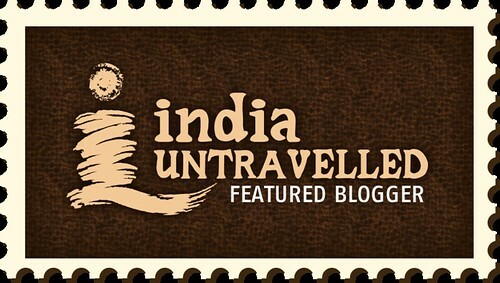 Punjab- The Land of Five Rivers has so much to offer to a traveller. The highway with lush green fields on either side and amazing weather welcomed us when we started our journey from Delhi to Punjab. A road trip to this part of India is perfect for rejuvenating, if you are bird lover you would enjoy spotting many of them. If romance is on your mind, early monsoon would be a good time to hit the roads with your loved one, listening to your favorite music plus slight drizzle creating it's own rhythm on your vehicle's windshield. The journey was fun, 30 km into the ride and we experienced heavy downpour and after an hour or so we continued with our ride only to stop every few hundred meters as the rain continued in spells for most part of our journey. We were completely drenched but our spirits were high and though we had rain gear with us, we did not think we would need it until we hit the mountains and so with "our impeccable packing" our rain gear was neatly folded and set right at the bottom of our saddle bag. We decided to enjoy the rains, stop at small dhabas, sip chai and laugh at our foolishness. 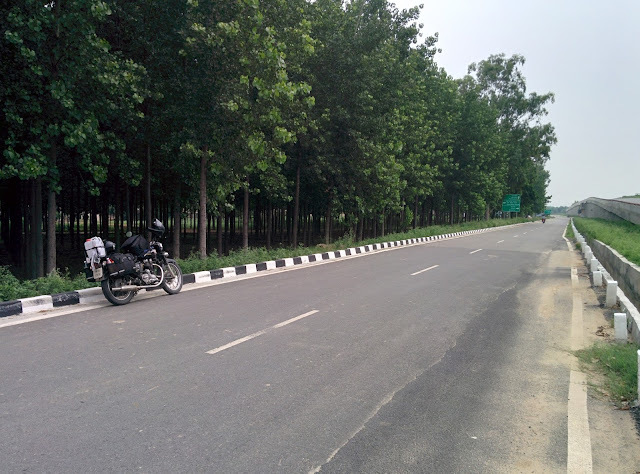 We got to experience rural Punjab and her fertile green lands when we took a deviation from the Delhi - Amritsar highway towards Patiala. As children we remember being taught in school that agriculture is the backbone of India but it was here in Punjab we saw people relentlessly working on their fields and not letting simple things like rain come in between their daily routine. These hard working farmers need to be treated with great respect but sadly in our Nation we have misplaced priorities where we idolize bollywood stars and sports personalities. As masses we are not even slightly concerned about the alarming pace at which we are losing fertile farm lands that are being replaced with real estate projects. Of course when you enter Punjab how can one not get excited about food. The best part about the Delhi - Haryana & Punjab belt are the numerous Dhabas that serve lip smacking desi food glazed with white butter. We started our road trip by digging into amazing hot aloo paratahas at Rasoi Dhaba. Parathas with dollops of butter are so tempting that you cannot stop until the plate is wiped clean and the best part is that it does not even feel heavy unlike the store bought pasteurized butter. 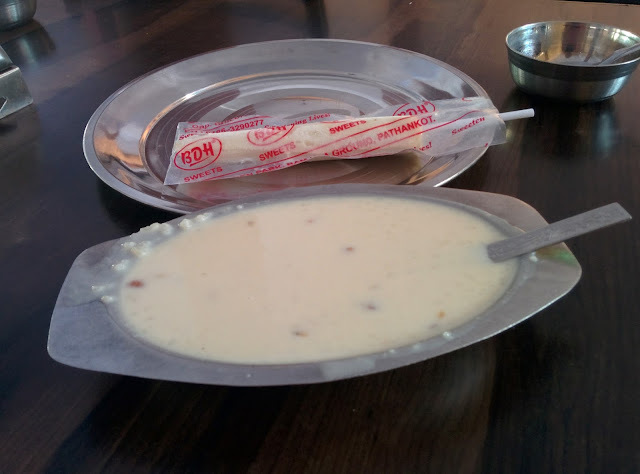 We also had amazing kheer and kulfi at Sanjha Chulla just before reaching Jammu and it was rich and lip-smacking. We were bowled over by Punjabi's love for food especially chicken and lassi, their kindness, hardworking nature, dedication towards sports and attachment to their motherland. We experienced their acts of kindness in every Gurudwara that we went to and their dedication to serve food free to everyone who comes to the Gurudwara without any discrimination speaks volumes about their pure hearts. We saw how committed they are when it comes to sports in Polo ground Patiala. Every morning the ground is abuzz with people warming up, exercising and playing the sport they love. They love to appreciate everything that is beautiful and Ludhiana can be considered a shopping hub as they have countless shops selling clothes jewellery, all at affordable prices. It is the one stop place for everything that one would require if there is a wedding in the house. Of course everyone also knows their love for Royal Enfield- Bullet. Punjabis and Royal Enfield ka love story is better than any Sharukh-Kajol love story. Punjabis love their association with this machine and they know how to take care of it as well. The streets of Punjab are filled with this mean machine and they are squeaky clean and very well kept. The local songs have lyrics that shows the romance between the men and machine. We were told by a local, an engineer turned teacher and a die hard RE fan that bullet is mentioned in most of their local punjabi songs and the most famous line being "You might not take a bath but will never forget to give your bullet a wash."
We saw and met a lot of bikers on the highway. This belt is filled with a lot of bikers since it is the time when the passes to reach Leh are open. This belt gives you opportunities to meet bikers and of course conversations take their own course and we end up exchanging itineraries, travel tips, crucial info and bond over the most beautiful things in life i.e bikes and travel. These few minutes of conversations with complete strangers ended with wishes of safe travel and riding and a beautiful bond is automatically created. 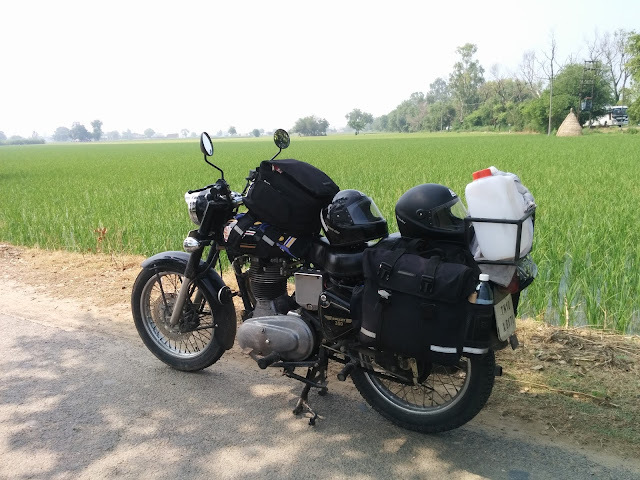 While riding from Patiala to Ludhiana we felt over whelmed and proud when an older gentleman on his motorcycle overtook our bike and seeing us all saddled up, he understood we were on a road-trip and gave us a broad smile and a big thumbs up. This act of appreciation from a stranger and of that age made our day. If you are a fan of Indian Air Force, then do head to Pathankot. The best part about Pathankot is that one gets to see several Indian Air force fighter jets sortie throughout the day and the thundering engine of these jets resonates around the town. 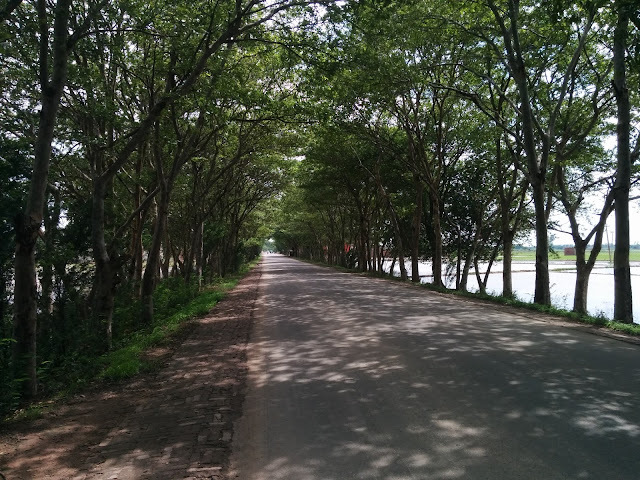 Also, Chandigarh is one of the best planned cities with brilliant roads and infrastructure. There are many more places in Punjab that are equally amazing and we hope we can come back again to this beautiful land of beautiful people.